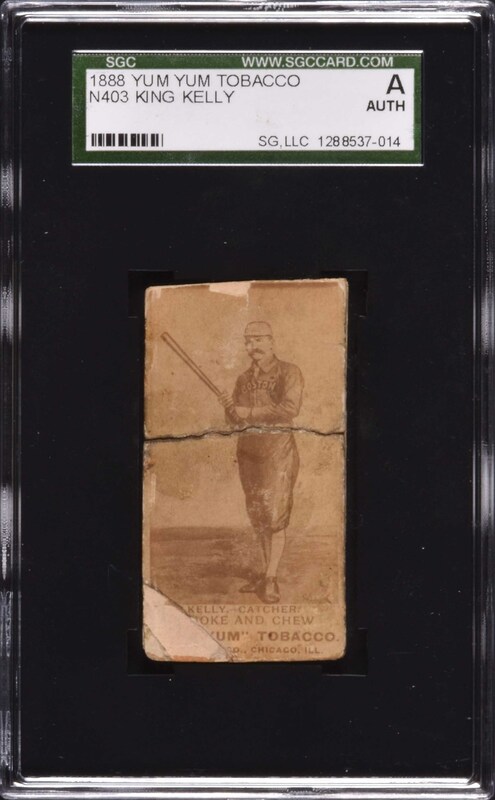 Extremely rare sample card from the Yum Yum Tobacco series of 1888 featuring Hall of Famer Mike "King" Kelly in a batting pose. Yum Yums have always been one of the 19th century's most legendary rarities. In fact, only 112 examples in total have been graded by SGC and PSA combined! Yum Yum Tobacco was a brand of the August Beck Company of Chicago. Since the earliest days of organized collecting, advanced collectors have appreciated the mystique of the rarest pre-1900 baseball-card issues, especially Yum Yum Tobacco cards. Whether it is because of the brand name, their unusual look, extreme rarity, or a combination of all of these factors, few card issues command the respect that Yum Yum Tobacco cards do among the most serious collectors. It is always a privilege to offer a Yum Yum, regardless of condition. 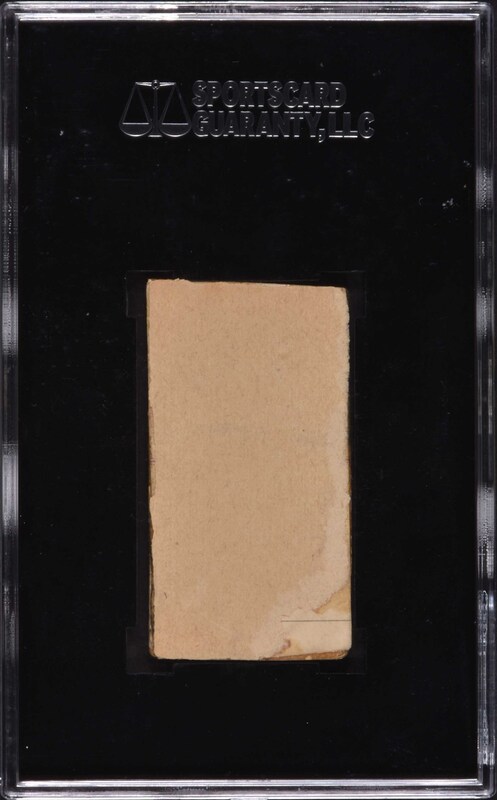 This particular example has been graded "Authentic" by SGC due to the card being separated across the center into two pieces and the lower left portion missing. The card is reinforced by what appears to be two layers of scrapbook paper on the reverse (most likely from album removal long ago). There is an irregular hand cut on all four sides. Aside from these obvious flaws, the card displays strong image contrast. Despite its modest condition, this card remains an exceptional line-drawn woodcut style sample (Yum Yums were also issued with photographic-style designs) from this extremely rare and desirable 19th-century set, featuring one of the era's most legendary Hall of Famers, Mike "King" Kelly. Reserve $500. Estimate $1,000/$2,000+.